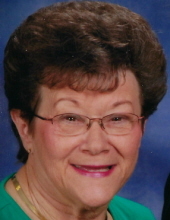 Norma Ann Clark, 75, of Paducah, Kentucky, passed away at 9:22 A.M. Friday, February 8, 2019 at her residence. Norma was born in the St. John Community of McCracken County on December 19, 1943 to William and Juanita Kloss. She was a member of St. John the Evangelist Catholic Church. She enjoyed Word Search puzzles and television game shows. She will be remembered for the love she had for her family, most notably her granddaughter MaKenzye. Mrs. Clark is survived by her husband of 54 years, Larry D. Clark; Her daughter, Lynnette Clark, of Paducah; her son, Dr. Kevin Clark (Christine), of Odenton, Maryland; her sister, Shirley Kloss, of Paducah; her brothers, Leo Kloss, of Barlow, Kentucky, Gene Kloss (Carole), of Oroville, California; her granddaughter MaKenzye Henson (Stephen), of Johnson City, Tennessee. Mrs. Clark was preceded in death by her parents, William Joseph Kloss, Sr. and Mary Juanita Kaufman Kloss; her twin sister, Mary Joan Sanderson and her brother, William Joseph Kloss, Jr.
A funeral mass is scheduled for 11:00 A.M. Tuesday, February 12, 2019 at St. John the Evangelist Catholic Church with Rev. Bruce Fogle officiating. Burial will follow at St. John Cemetery. Visitation will be held from 5:00-7:00 P.M. Monday, February 11, 2019 at the Lone Oak Chapel of Milner & Orr Funeral Home. Prayers will begin at 5:00 P.M. Expressions of sympathy may take the form of contributions to: Project Hope Humane Soceity, 1698 W. 10th St., Metropolis, Illinois 62960. You may leave a message of condolence or light a candle of remembrance at milnerandorr.com. To send flowers or a remembrance gift to the family of Norma Ann Clark, please visit our Tribute Store. "Email Address" would like to share the life celebration of Norma Ann Clark. Click on the "link" to go to share a favorite memory or leave a condolence message for the family.